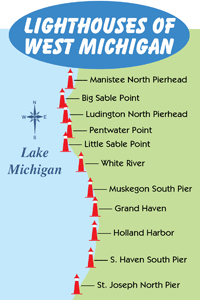 Lake Michigan is surrounded by numerous lighthouses--each one unique and special in its own way. Northwest Michigan has its share of lights that you can photograph, tour, and enjoy. 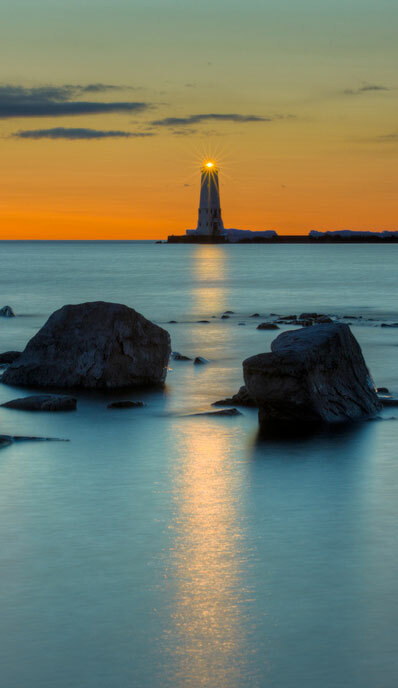 From the Frankfort Breakwater Light up to South Fox Island Light Station, be sure to visit them all and learn about their maritime history. Timeless charm and easy accessibility explain why Point Betsie is one of the most photographed lighthouses in the state of Michigan. Parking your car just yards away from this beauty, you'll be welcomed by the sights and sounds of Lake Michigan. The Point Betsie Lighthouse marks the southern entrance to the Manitou Passage and is just south of Sleeping Bear Dunes National Lakeshore. It is listed on the National Register of Historic Places and features an accompanying fog station. 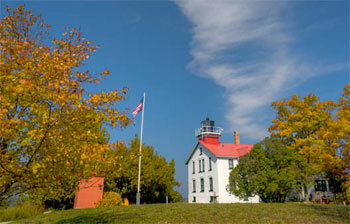 Read more in our Point Betsie Lighthouse story. A visit to the charming city of Frankfort in Benzie County wouldn't be complete without a trip to the Frankfort North Breakwater Light. The current light was constructed in 1912 and placed on the National Register of Historic Places in 2005. Standing 44 feet tall, the light is placed on top of a 25-foot tall square steel base. The cast iron lantern room, which is surrounded by a gallery, originally contained a fifth order Fresnel lens that was upgraded to a fourth order Fresnel lens. Located on the west side of downtown Frankfort, you can walk the breakwater out to the lighthouse, and fish off the pier. 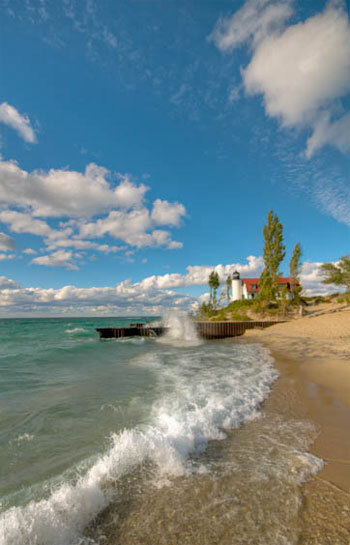 To reach the Frankfort North Breakwater Light, take Main Street to the beach where there is public parking, a playground, and benches for relaxing and enjoying a spectacular Lake Michigan sunset! Located at the end of the Leelanau Peninsula within the Leelanau State Park, the Grand Traverse Lighthouse is one of the oldest lighthouses on the Great Lakes. It is open daily for tours and offers special events throughout the year. 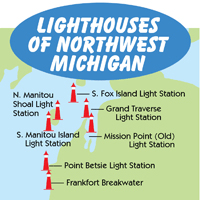 Read more in our Grand Traverse Lighthouse story. Set at the northern most point of Old Mission Peninsula, you can climb to the top of the tower, visit the gift shop, and explore the many trails that are found within the park. 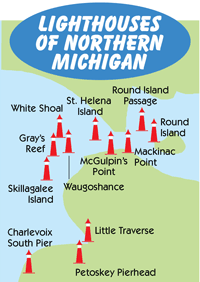 This island and its lighthouse is situated between Beaver Island to the north and the Manitou Islands to the south. It was recently restored to its original beauty, with a paint job, rust removal, and the removal of overgrown foliage. 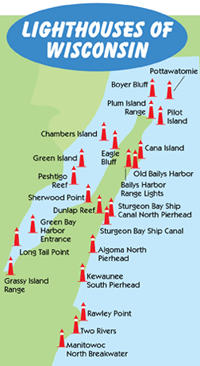 This 100' lighthouse is located on the eastern side of south Manitou Island. It has also been recently restored and located nearby is the U.S. Life Saving Service Station.